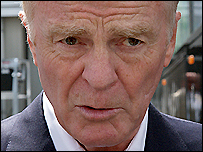 Motorsport boss Max Mosley seems to have cleared Honda of any involvement in the Formula One spy row and says the saga should be resolved in three weeks. Honda became caught up in the furore after it emerged that team boss Nick Fry had met Nigel Stepney in June. 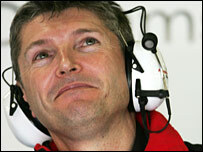 Stepney was sacked by Ferrari after being accused of leaking secrets to McLaren chief designer Mike Coughlan, who was also at the meeting with Fry. But Mosley said: "There's no suggestion Honda are in any way involved in this." The president of FIA, motorsport's world governing body, added: "I hope that, as far as the sport is concerned, it should all be clarified within the next three weeks. "We're looking into the whole thing at the moment and when we've got all the facts then we will decide what to do. "Both McLaren and Ferrari are giving us all the information that we want and we are asking questions. "We will be writing to both teams next week with more questions and taking it from there." Fry insists the meeting with Stepney and Coughlan was purely to discuss employment possibilities. A Honda statement added that at "no point was any confidential information offered or received". Stepney, formerly Ferrari's head of performance development, was dismissed on Tuesday, followed within hours by McLaren's suspension of Coughlan. Civil proceedings are active against both men - long-time friends and former colleagues at Lotus in the late 1980s - over the alleged theft of technical information. A 500-page dossier is understood to have since been discovered at Coughlan's Surrey home, with the two men seemingly colluding from some time in late April. The Honda statement added: "Given the speculation surrounding the legal investigations at Ferrari and McLaren, Honda would like to clarify that earlier this year Nigel Stepney requested a meeting with Nick Fry. "Nigel Stepney subsequently met in June of this year with Nick Fry and brought with him Mike Coughlan of McLaren, with a view to investigating job opportunities within the Honda team. "Nick Fry informed Jean Todt and Ron Dennis of the meeting and has offered to provide any information required by Ferrari and McLaren." McLaren boss Ron Dennis, like Fry, insists his team are also in the clear and says "the truth will come out". However, he has been hurt by what he sees as Coughlan's lack of loyalty. "There are unwritten limits to which people should adhere, and clearly what has happened here exceeds all previously known occurrences," said Dennis. "For me, this is not a great experience because one of the things I put alongside integrity is loyalty, and that has also been a difficult emotion (to deal with)." Explaining what has transpired, Dennis added: "The first thing I did when I first learned of this problem was to phone Jean Todt; the second was to phone Max Mosley (FIA president). "Within one or two hours of this situation coming to light, we invited the FIA to conduct a full investigation. "From the beginning we have been co-operative, and we immediately brought independent people into the company to analyse things. "I feel as much as the reputation of McLaren has been challenged, and in all instances unfairly challenged, the important thing is to set an example in a very correct way. "We are co-operating with both the FIA and Ferrari. Any time any information has become available to McLaren, we have shared it with Jean Todt and Max Mosley." It is anticipated the FIA will act sooner rather than later, and that their investigation will be concluded before the European Grand Prix at the Nurburgring in a fortnight. "Clearly, if an individual has access to information, you have to determine for what purpose it is going to be used," said Dennis. "I can tell you the purpose for which it was not used was to have any influence on our Grand Prix cars. "I can categorically state there are no developments whatsoever that have occurred on our cars, in the months preceding 28 April or the months following, relating to this. "I can comfortably say this will not end in anything that causes McLaren any embarrassment."